Guidebook to 50 walks in the North York Moors National Park. The walks, which range from 4 to 13 miles, are distributed through seven regions within the park, enabling walkers to discover and appreciate the Tabular Hills, Hambleton Hills, Cleveland Hills, Northern Moors, High Moors, Eastern Moors and Cleveland Coast. For those who like a challenge, the course of the classic Lyke Wake Walk, crossing the national park from east to west, is also described. For each walk (most of which are circular), step-by-step route description is accompanied by extracts of OS mapping. Points of interest are highlighted, and background information provided, detailing the history and industry of the area. The guidebook also includes planning and preparation details such as when to go, where to stay, and how to get around using public transport. Comprising the largest continuous expanse of heather moorland in England, the North York Moors offer a wonderful sense of spaciousness, with extensive views under a 'big sky'. 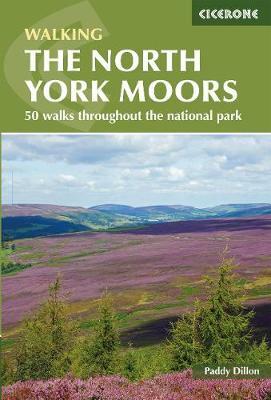 People have crossed the North York Moors since time immemorial and some of their routes survive to this day. It is a place of great history and undeniable charm, making it a worthy walking destination.